The reality is that in the 2016 election it now takes more than a majority for a Republican to win. Romney, for example, won about two thirds of all precincts nationwide and probably got in the range of 55% of the verifiable vote, but lost the election to nearly unanimous Obama support from nearly 100% turnout of potentially eligible voters in inner city precincts in key states like Ohio, where the certainty of being accused of racism for even thinking you couldn't get that level of turnout for a week of free pizza and beer prevented any form of verification. 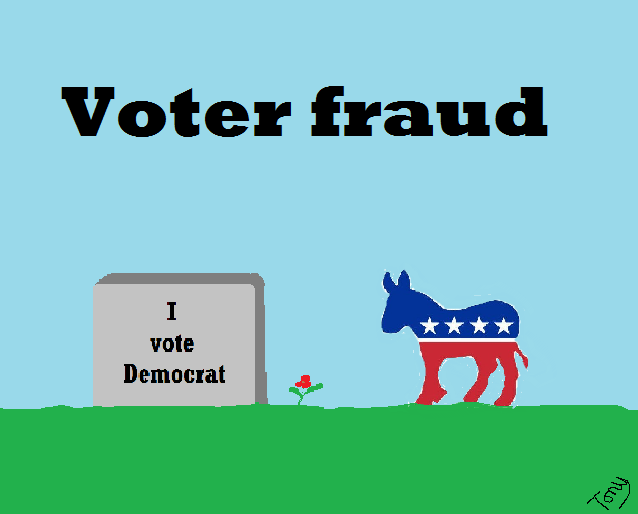 Democrats hide the extent of fraud by combining a line of patter denying the existence of voter fraud while accusing Republicans of it with media blitzes publicizing and denigrating isolated, and often not very credible, claims like those that some voting machine somewhere mis-recorded a few conservative votes as liberal. This is stagecraft 101 for magicians and propagandists alike: focusing audience attention on the insignificance of the occasional process failure in elections where millions of votes are counted while simultaneously raising emotional and credibility barriers against those who might otherwise get people to look a bit more carefully at what other members of the Democrat team are doing. The Secretary of State Project, (apparently originally funded by George Soros) which seeks to put Democrats in charge of both the voting, and the vote counting, processes has now succeeded to the point that a majority of American voters are affected. Extending the duration of, while weakening eligibility and verification criteria for, all forms of advance voting. Using litigation, and the threat of litigation, to sway electoral process decisions in favor of Democrats and against Republicans. Democrats see lawfare, and more importantly the threat of lawfare, as a perfectly legitimate way to win elections. Thus their tendency to publically stress their commitment to having lawyers present during the counting and related processes for close elections, coupled with their actual commitment to challenging all close losses by filing lawsuits naming everyone involved anywhere in the process, forces electoral officials facing difficult decisions to choose between the mild criticism they can expect from Republicans if they decide for the Democrat and the near certainty of a starring role in Democrat lawsuits to be heard by Democrat judges amid unrelenting, unprincipled, and deeply personal media attacks if they decide against the Democrat. Encouraging the proliferation of system disconnects in advance vote and vote counting processes. In particular abuse of the Help America Vote Act (2002) has enabled Democrats to insert significant new opportunities for voting fraud into the system. For example, the use of Wintel (Windows on Intel) architecture voting machines usually justifies the use of precinct level "servers" to collect local data that is then passed to other servers "up" the counting hierarchy. Since each level uses programmable machines that can be subverted, each such disconnect offers multiple opportunities for fraud. For example, servers at or above the precinct level can safely add entirely fictitious votes to the count provided that total turnout does not become so absurd as to attract attention, the fraudster has the list of advance voters, and either the list of people who voted at the precinct is electronic or the fraudster has the access needed to either replace or modify the precinct's paper records. In this situation the modified data from the server passes into the totals unnoticed during the rush to the count, while the immediate post election lassitude affecting those involved in high pressure, late night, activities provides the time and opportunities needed to adjust precinct records to cover the lie. This is fairly easy to do and relatively low risk because a Democrat win on the first count means that no one of consequence will question the result while cursory reviews will show that the number of votes counted for each affected precinct is within one or two of the number of voters -- and, of course, Democrat judges can be counted on to admit missing ballots produced at leisure and "found" in somebody's car or a church basement in the rare event that the Republican hangs in long enough to force a physical count. The bottom line on this is simple: the analogical frog needs to jump, and right now, if the 2016 and subsequent American elections are to be won by 50% + 1, and not by combining 40 something percent with fraud and a compliant judiciary. It's too late to radically change the voting or vote management processes for 2016, but legislators now in office can move immediately to remove or limit the use of lawfare to affect electoral process decisions. In particular, it shouldn't take a Bader Ginsburg outburst to show that the much of the judiciary has become deeply politicized, is correspondingly unfit to render impartial judgement on deeply political issues, and should therefore not be called on to settle electoral disputes -- meaning that other means of settlement, such as legislative committees or investigative juries made up entirely of retired police officers, must be found and empowered.